The Aucilla River flows through a rugged and sparsely populated slice of Florida's Big Bend region as it meanders to the Gulf of Mexico. The scenic river has a rich history, remarkable geology, and abundant wildlife. Anglers, paddlers, and boaters enjoy exploring this waterway as it courses between banks lined with limestone formations and disappears underground within the 47,622-acre Aucilla Wildlife Management Area. The Aucilla River flows through a rugged and sparsely populated slice of Florida's Big Bend region as it meanders to the Gulf of Mexico. Originating from artesian springs in Georgia and flowing 111 km to the Gulf, the river picks up tannins from decaying vegetation along its journey. The water acquires a black tint, hence its description as a “blackwater” river. When it passes through the sculpted limestone landscape known as karst, the inky water provides a stark contrast to the chalky-white limestone. 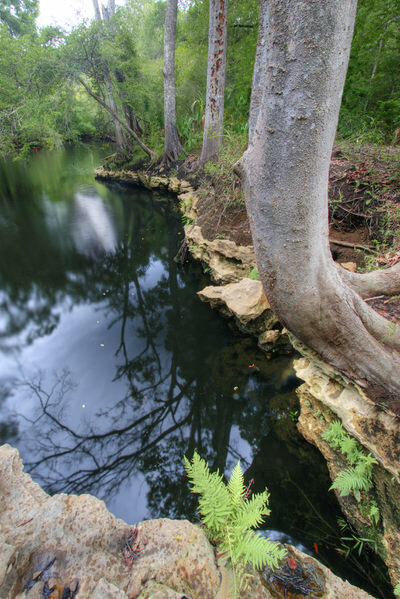 Acids in the tannins and rainfall slowly eat away at the limestone, creating a region marked by sinkholes, caves, springs and disappearing rivers. The river's unusual geology, long cultural tradition, and abundant wildlife, add interest and intrigue to the swamps and shady woodlands of the 47,622-acre Aucilla Wildlife Management Area. 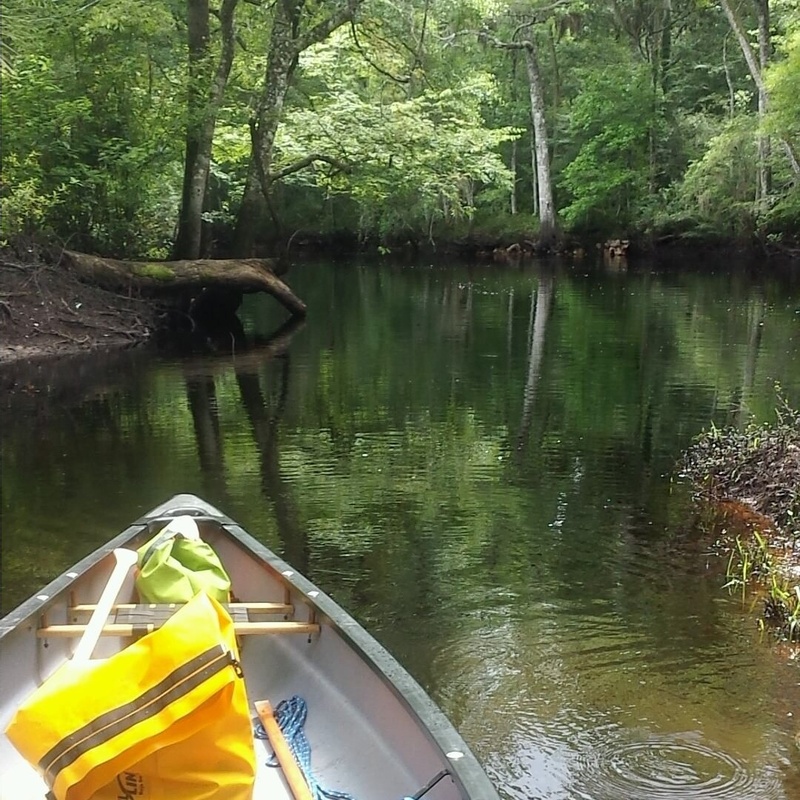 The Aucilla River is designated as “Special Waters,” part of the “Outstanding Florida Waterway Program” and is a state-designated paddling trail popular with paddlers and anglers. Depending on water levels, a stretch of rocky shoals and rapids can challenge even experienced paddlers. A round-the-clock phone message with water level information is available so that visitors may plan their excursions when water flow is optimal. The upper stretches of the Aucilla pass through swamps, shaded hardwood forests, and high limestone banks. As it journeys to the Gulf, the river gradually widens, flowing through panoramic palm-fringed vistas of salt marsh. Power boats ply the lower portions of the river and anglers find productive fishing here and all along the shallow coastline. 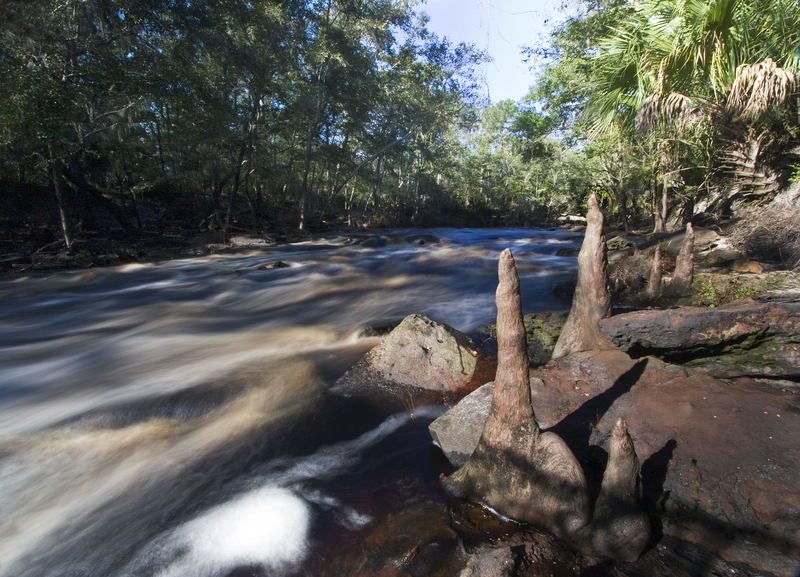 A portion of the Aucilla River flows through a landscape of dramatic and unusual geologic formations. 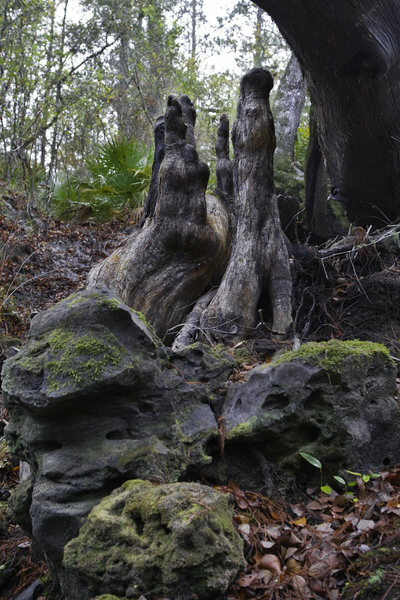 These natural sculptures mark the beginning of a sequence of sinks and river rises, created as the river alternately disappears into the underlying karst and resurfaces. Fringed with moss-draped trees and native palms, the sinks are pools of black water that entice anglers to cast lines from surrounding embankments. One of the best ways to observe the phenomenon of this vanishing river is to hike along the Aucilla Sinks or River trails, popular segments of the Florida National Scenic Trail. After miles of this hide-and-seek game, the river finally emerges at a large spring at Nutall Rise and continues its journey to the Gulf. The human dimension of this wildlife-rich Aucilla River landscape extends back 12,000 years to the Pleistocene era when mastodons, saber-tooth tigers and other large mammals roamed a landscape that resembled the African savannahs of today. The 1983 unearthing of a 12,000-year old mastodon tusk exhibiting cut marks – evidence of slaughter by humans – provides some of the earliest known evidence of man on this continent. The Paleoindians hunted the big game using spear points and tools fashioned from chert, a kind of flint mined from the rocky outcrops. When rising sea levels brought the coastline closer to its current location, Native Americans hunted deer, fished in the rivers and harvested oysters and other seafood at the coast. Today, the region's bounty continues to attract hunters and anglers. Enjoy wildlife on the area by taking a quiet paddle early in the morning or evening, walking the trails, or biking along the network of small roads. The river's extensive floodplain provides excellent food and cover for bears, deer and other wildlife. This area is part of the Great Florida Birding and Wildlife Trail and a rewarding spot for wildlife viewing. The Florida Fish & Wildlife Conservation Commission partnered with the Suwannee River Water Management District to create a map guide for the ‘Rivers of AWE', the Aucilla, Wacissa, and Econfina Rivers, which can be ordered on-line through the Wildlife Foundation of Florida. These two public agencies also partner during National Public Lands Day events recruiting volunteers from 4-H clubs, home school students, local paddling & hiking clubs, hunting groups, and university students. Volunteers plant native plants, pick up litter, and spruce up campgrounds. Boy Scouts have also volunteered with FWC and state archeologists to survey pre-historic mound sites while learning about conservation and protection of cultural & historical resources. Segments of the 1,400-mile Florida National Scenic Trail run along the banks of the Aucilla River offering wonderful hiking opportunities. The Aucilla River merges with the Wacissa River, another state designated paddling trail and flows to the Gulf of Mexico where it becomes a part of the Big Bend Saltwater Paddling Trail (BBSPT), designated a National Recreation Trail in 2005. The BBSPT offers an unforgettable 105-mile coastal paddling adventure for experienced sea kayakers with primitive camping skills and comfortable with rugged conditions. 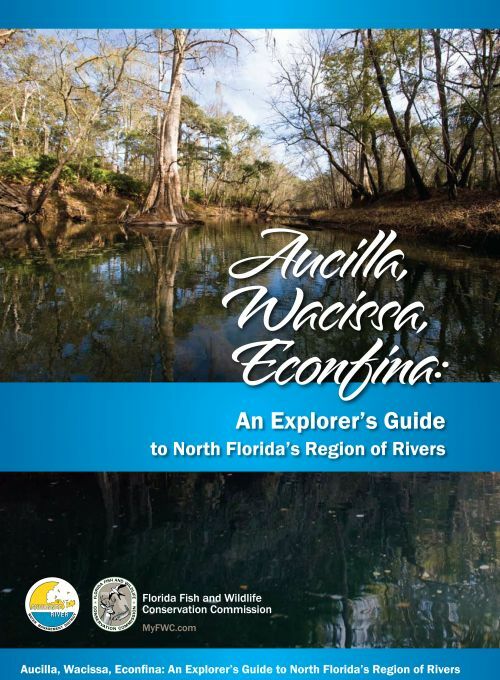 The Aucilla/Wacissa/Econfina Rivers: An Explorer’s Guide to North Florida’s Region of Rivers water resistant map is available through the Fish & Wildlife Foundation of Florida. Launching on a Sunday afternoon on the Aucilla River Trail. Photo by Britney Moore.